For both adults and children alike, experience up close and personal some of the most fascinating creatures on our planet in the comfort of your own home, local hall, at school, event, club or even your place of work. 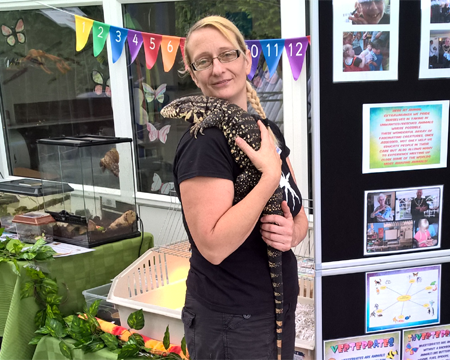 Here at Animal Extravaganza I have a wide range of wonderful and unusual animals from Snakes and Lizards, Tarantulas, Insects and more, plus more familiar animals such as Mice, giant and mini Rabbits, Guinea Pigs and Chickens, including my very friendly Cockerel. Many of the animals at Animal Extravaganza were unwanted or rescues. To meet the animals, please visit the Animals page. Not only educational and a lot of fun, it can even help some people overcome a phobia. Handling of many of the animals is involved for those who wish to and plenty of photo opportunities to take home lasting memories. Animal Extravaganza is available for birthday parties, school talks, care homes, and corporate events, photoshoots and even weddings. If you have any ideas of your own, do please contact me and I will see what I can do for you.